Once upon a time there was a peaceful and lovely kingdom called Didsburyland. The place was well known for its beautiful houses, fashinating gardens and joyful parks where the inhabitants used to have long and relaxing walks, smiling at children playing in the fields and at dogs chasing balls and sticks. All the little shops, cafes and restaurants where just another reason to fall in love with this land. One day a beautiful Princess from the far and sunny kingdom of Italyland arrived in Didsburyland with her adorable Dog. She was delighted by the beauty of the place and she was very proud of being part of such a lovely community. Unfortunately, she always felt something was wrong, was missing: she was homesick. One night, she was sitting in the garden enjoying a very rare starry night and whispering to the Dog, she made a wish: to wake up the morning after, and to have breakfast in her mum's happily noisy and cosy kitchen. Little she knew that in that exact moment a falling star was crossing the sky above. The following day the princess woke up, and grimacing at just another rainy day, she decided to go for a walk with the adorable Dog. Just around the corner the dog stopped abruptly, refusing to obey to the princess's commands. And then she saw it: in front of her was an enchanted fairy palace. The curious princess couldn't help herself so she entered inside the magic place. What she saw left her speechless: she was in a little enchanted fairy kitchen. Everything had been brought back from the past by the magic fairy. A bunch of colourful tables were in the middle of the room, all decorated with fresh flowers; every single wall was covered with fairy crafts, cards, books and old magic baking tools, that remind the princess about her nana’s kitchen. 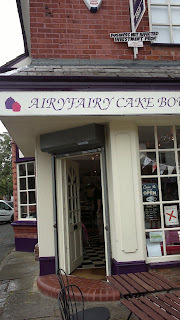 On the fairy's desk , the most stunning selection of cake ever seen was displayed. Like a garden in full bloom, were all sort of cupcakes; the most decadent chocolate brownies were surrounded by just baked scones; a delicious cheesecake was just on the side of a bouquet of the most finely decorated pop cakes. Towering on the shelf there were a glorious Victoria sponge and the softest of the strawberry cakes. From the back side fairy kitchen, the most exquisite and mouth watering smell was filling the air, a smell of cakes never tasted before, but already in the dreams of the princess. The fairy was there to welcome her and she offered to teach the amused princess to bake all those delicious and precious cakes. She then noticed she was not alone in the enchanted kitchen: Didsburyland inhabitants had been attracted by the magic place in the same way she had been, and they were all enjoying the new addition on the happy community. There she was, a mother helping the daughter to choose the cupcake for the little sister, a chatty man entertaining his neighbours with football chronicles, a beautifully noisy family of five trying to decide what to eat first from a assorted selection of delicious sandwiches, a little cheeky chappy trying to fit two cake pops in his mouth and a very sweet Nana singing an adoring toddler a nursery rhyme; the place was full of happiness, joy, magic and love. The Princess was there, and whilst sipping her lukewarm cappuccino (the Princess favourite) and enjoying the taste of the strawberry cake melting under her palate, she closed her eyes and she though: this really feels like being home. And so the kingdom of Didsburyland become a magic land, and the Princess, the adorable Dog and all the inhabitants there they lived long and happily. The Princess is always a very happy princess in didsburyland and goes to the airy fairy enchanted palace regularly but has been forced to join the gym and weight watchers, and has learnt the lesson that she has to stop eating cakes all day long because it’s raining outside and she feels depressed. The adorable dog still doesn’t understand why the falling star didn’t make his dream come true, and he is still not allowed in 99% of the lovely places in Didsburyland. 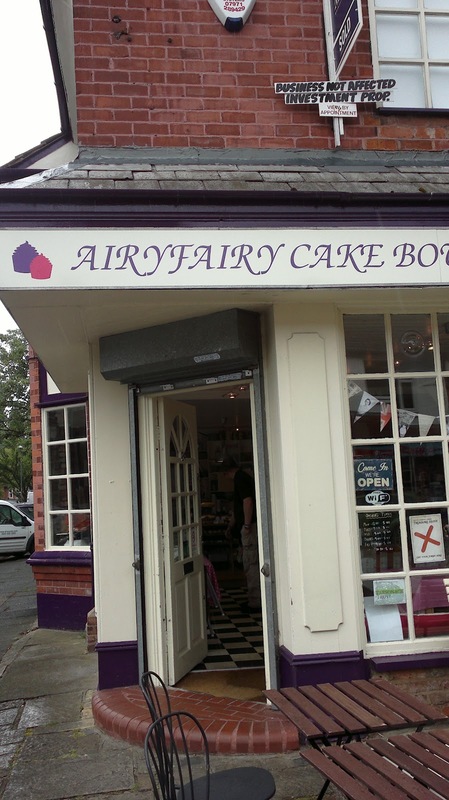 Airyfairy cupcake boutique is located in didsbury village, school lane,m20 6rg and is opened from Monday to Saturday. The fairy gives you the opportunity to book for all sorts of classes and can realise her special creation for your birthday, wedding, anniversary or any special day you want to celebrate. First tough of the day: it cannot get any worse, so Anna stop complaining and enjoy your holiday, f**k the bloody card. At least it was not raining anymore but has been a bloody cold and windy day. Me and perfect husband got the tour bus, we have been so brave to sit in the top (seriously, what are you gonna see from the inside?) to have a good view. So we were freezing but happy! The tour guide explained us that a big fire, the great Chicago fire, destroyed the city in 1871, so what you see now is a mixture of old buildings together with new and renewed ones that were part of the reconstruction after the big fire. The part of the city I liked most was "the loop": it's name is due to the train line that in this part of town goes around the streets in a loop. An underground was supposed to be built but apparently this area became such a landmark that was left like that. The big withe building on the right is the Prudential Building and is there that Obama found out he was gonna be president. The building overlooks millennium park and the guide told us that that night all the city came over to celebrate the victory! Most amazing thing of the day? In the afternoon the temperature raised of 10 degrees and a wonderful sun came out, so we went to the lake. Chicago is on the coast of the Lake Michigan so you will have not just a beautiful skyline, but a proper sandy beach. My husband had to go to a meeting, so i went to the beach and then to the Aquarium, that will have it's separate post because it was just amazing! Anyway i must say...I love Chicago!!! My first day in Chicago has been nothing less than a nightmare. First of all the weather: rain, wind, cold. Compare to that Manchester looked like Costa Del Sol. Second: my debit card was nowhere to be seen. Last time I used it was in Manchester airport...and probably is still there. Of course I am not to be blamed about this: it's only the third time that something like this happens and I am sure that card flow out of my purse on its own. You can imagine what is it like to be on holiday, in a shopping paradise.. with no money and a husband/mum/dad sister asking you "Really??? Did you do it AGAIN? ". Anyway few positive notes: the hotel was stunning! Sheraton Hotel in the heart of the city, gorgeous view, spa, pool, deluxe suite, walking distance from everything I wanted to visit. It's the white building you see on the left of this picture. We went out for dinner, hamburger and fries (we are in USA after all!!) and for a walk in "the magnificent mile", so called because it's a mile of pure luxury and shopping: Macy's, Sack's, Bloomingdale, Nordstrom, Victoria's Secret, just to name a few, plus very posh restaurants and bars. And I don't have my card. How am I gonna survive?? I cannot resist statement red lips, it's an addiction I don't want to treat, like for the kinder eggs and the lukewarm single shot soy milk cappuccino. That's why there was no hesitation in my purchase from the last mac collection Hey!Sailor. After a desperate hunting, on the web and in all the stores around, I manage to get hold of these, thanks to the best ever mac counter in Manchester: I am talking about the House of Fraser one of course! I got the lipstick in red racer and the lipglass in send me sailing. Have a guess? they're both pure red! Packaging is cute, navy blue e white stripes, well what do you expect in a collection called that talks about sailors? The lipstick is a satin, very rich, pigmented and bright. it's not the most original of the shades, you will probably find a million dupes for it (most of them in my drawer). 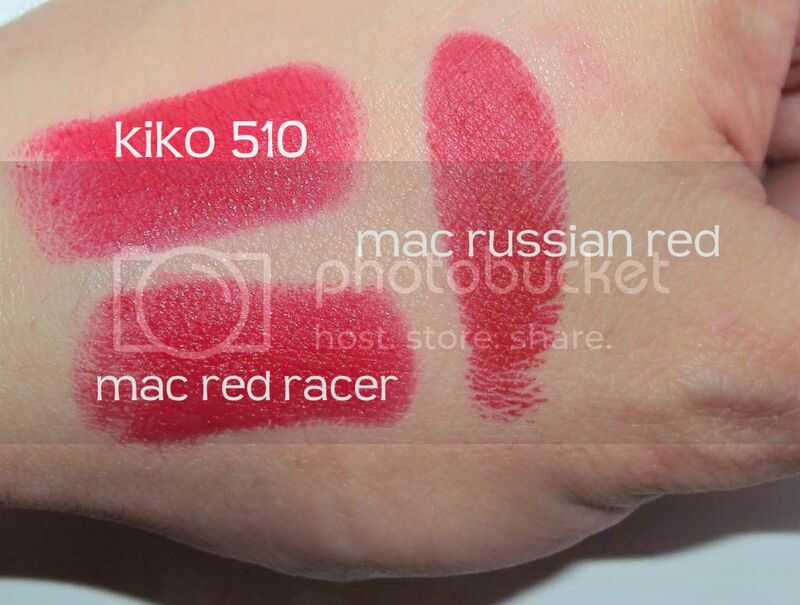 Here are some swatches of other red lipsticks I own, as you can see is very similar to Russian Red. The lipglass is my favourite one, look at that!! I was gonna buy the lipglass Russian red from the Fashion Sets but after I swatched it I can tell you there is basically no difference in between the two. The lipstick is retailed for £ 14 and the lipglass for £13.50. Next collection out should be Beth Ditto's one, hopefully I will Be able to buy it in Chicago saving a couple of pounds.